The fruit of the kola tree is a yellowish-brown woody pod that contains several large, flattened, white or red nut. 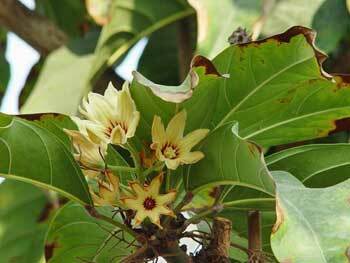 Grows wild in West Africa and is cultivated in tropical South America and in the West Indies. The kola or cola nut has been used for ages in Africa as a masticatory; often combined with grains of paradise. The nuts were used to make a stimulating native beverage. Natives sometimes endured hardships or dangers in order to obtain a supply of kola nuts. The nuts contain 1.1% to 2.5% caffeine and kolanin. The stimulating effect of the nuts, when chewed, is more slowly produced and longer lasting because the caffeine-kolanin constituents are combined with about 50% nutritive matter. Kola nuts, in the fresh state, are bitter at first but this is soon followed by an agreeable sweetish taste.. Nuts are much used in “soft” drinks and in liqueurs and wines. Exported kola nuts, as we receive them, become extremely hard and are not used as a masticatory. Kola nuts contain more caffeine than coffee berries and are taken as a stimulant to prevent fatigue. They also act as a tonic agent for the heart and are sometimes useful in relieving pains of neuralgia and headache. Infusion: steep 1 tsp. kola nuts in 1 cup water. Take 1 cup per day. Powder: the powder can be taken conveniently in size 00 gelatin capsules, 1 or 2 at a time as needed.